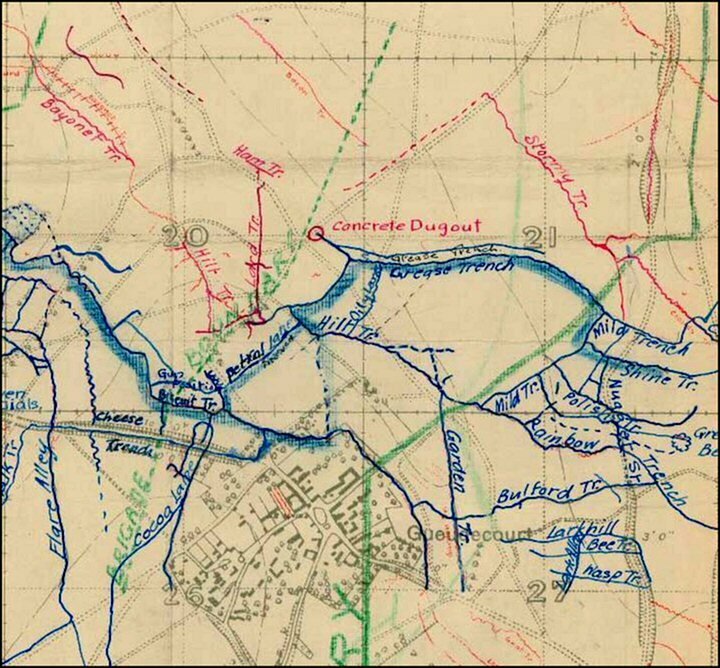 Looking for Trench Map covering the area of Mild and Cloudy Trenches, ideally, October 16. Many thanks for that. Just a point of interest, is that the Newfoundland Caribou in the background of the photograph? Ten out of Ten Chris. I don't sorry. I only have September/ October 1916. Just arrived 1 hr ago in Alabama from Europe trip to gueudecourt where I took some pics a couple of days ago; here is a panorama left is Thilloy, right is Gueudecourt, viewpoint is the "Luisenhof"
Hey, that's great Egbert. Hope you had a good trip. Hey guys, what can i say, fantastic. I'll drop you a P.M. egbert. Thanks for all your input Pals! Any more maps and pics, maps from the dates between Oct - Jan? 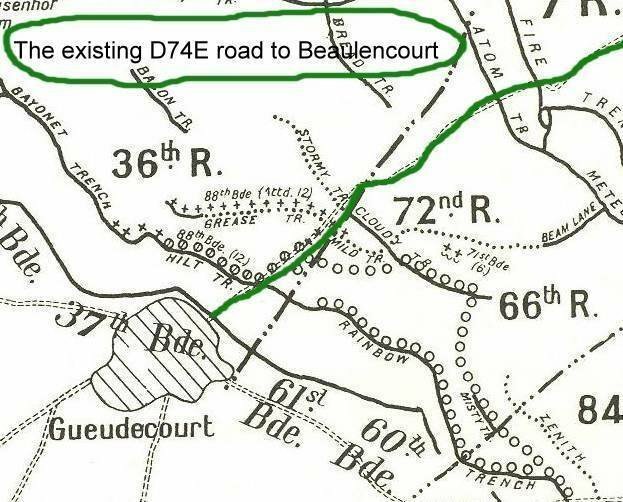 What are you looking for in particular I have a number of maps of the area between Oct 1916 and early 1917.
any trench maps for that time period. my relative died from trench foot and his battlion was in the trenches near there. heres a list of the were he was during the date he mustave got trench foot. he died 5/1/1917. he was buried in rouen so i suppose he was brought outta the line mid decemeber or so. im not sure this is where the trail goes cold but im looking for maps of the area. arial recconsance maps for this time would be extra special. 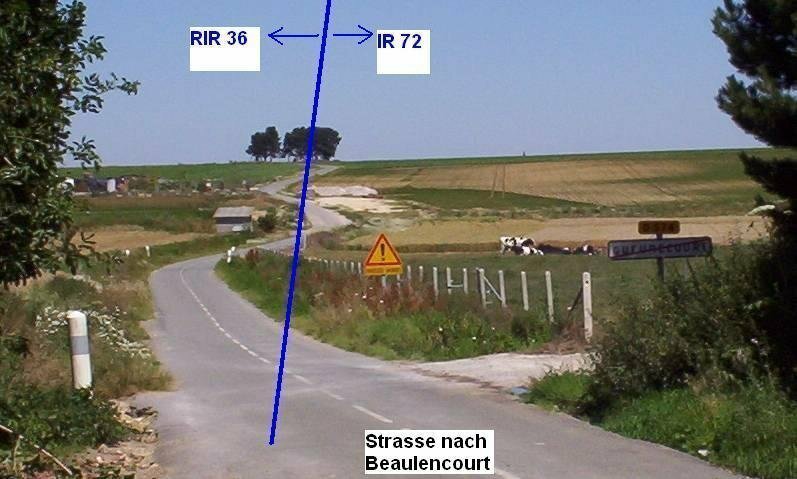 8th to 10th in trenches at Guedecourt. Attack 3rd November. 3rd to 6th January at Camp XVIII at Carnoy. Having walked this area for the first time this March ( visited bits every now and then but never in depth) found the area fascinating. 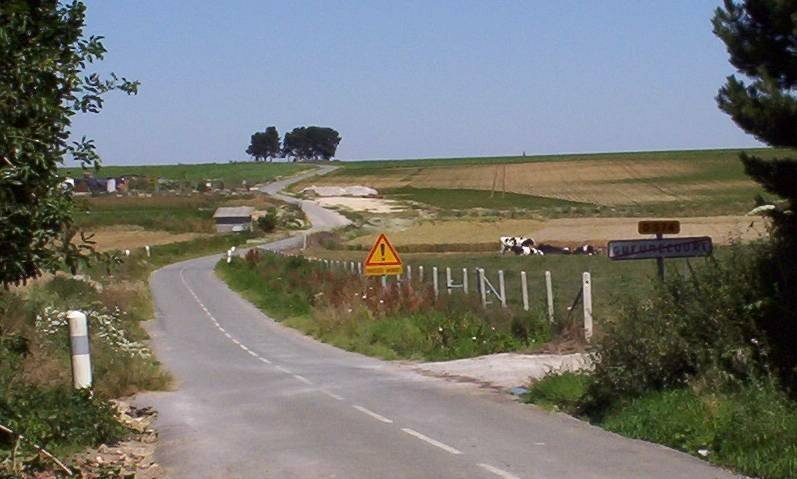 It is a forgotton part of the Somme as is much of the Oct / Nov battlefield. We are travelling this weekend to Gueudecourt in remembrance of a friend of mine's Grandfather Sargeant Bob Eades of the 2nd South Wales Borderers, killed on 20th October 1916 at Cloudy Trench Gueudecourt. He is remembered on Thiepval memorial. We understand that Cloudy trench cemetery was relocated to Bancourt cemetery and he may be one of the unknown laid to rest there. Is this likely? Thanks for all the helpful trench map details in advance. 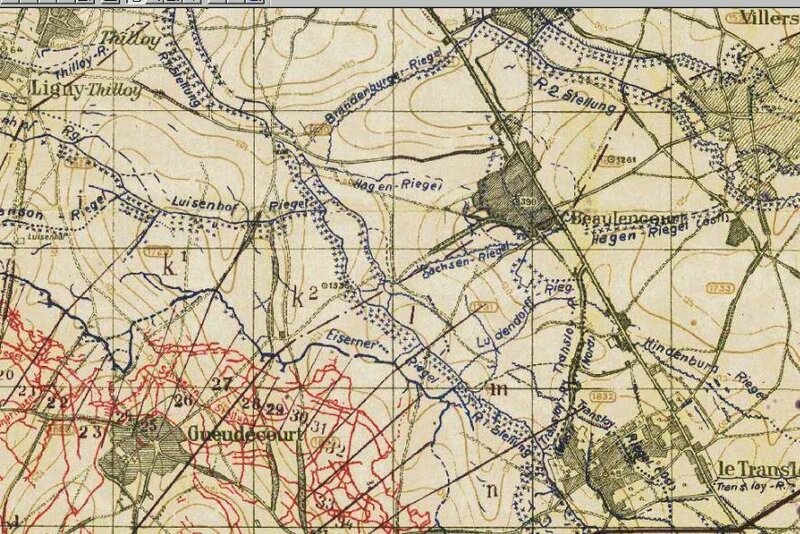 I'm new to this but I'm looking for a trench map that shows Support trench, Bull trench, Pioneer trench, or maybe Cavalry trench near Flers Wood and Gueudecourt. (I'm confused by varying accounts) I am researching the death of an Australian soldier, 4751 Private Eric Simson Bisset. I am an artist and want to use a map as part of an image. 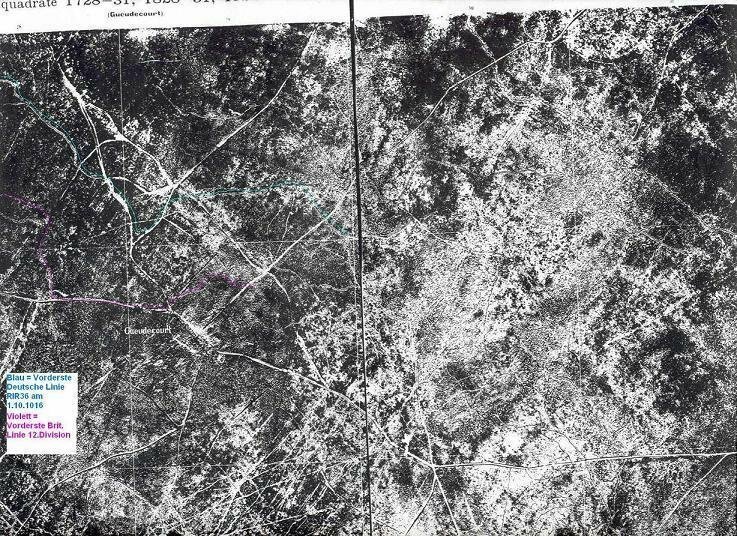 I would appreciate help with a map that shows these trenches. I didn't find mention of Bull or Cavalry trench in the battalion unit war diary or the 12th Infantry Brigade (their headquarters). Good luck with your search and we hope you will share your image when your research is complete! I appreciate you taking the time to help me with this. I need to find a high res image of a map of the place where ES Bisset died, so I am attaching a link to these Red Cross Society accounts - perhaps they will mean more to you - if you have time to examine them we could get more specific. I also have some questions about how to read the maps. Could you please explain how to interpret these locations for example? I saw an aerial shot of the region on this feed from egbert. Does this tally with the trench maps we are looking at? Best wishes and thank you for answering my questions.